How can we help eliminate homelessness by providing a community of affordable micro-housing? 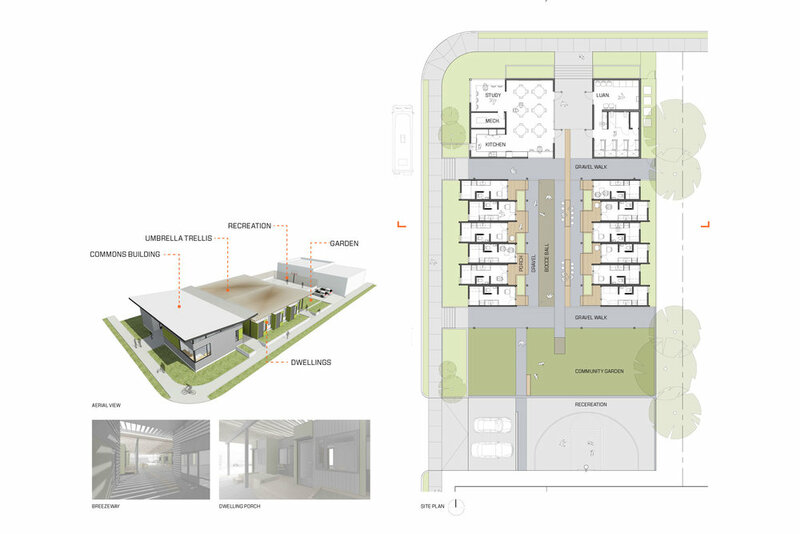 The goal of this project is to create a new typology for urban housing that helps address the problem of homelessness in urban centers by providing a stable dwelling place for those coming out of homelessness. Community is fostered through common activities and interactions that build and strengthen personal relationships. The project provides a core space to foster these relationships and an adaptable framework as community grows and contracts. 12 prefabricated dwelling modules are arranged adjacent to one another to form a central community porch. From street side this gives the appearance of a human-scaled urban building, rather than loosely organized mobile dwellings. The community porch is centralized to increase resident interactions, provide visual and sound connections, and create a sense of safety. A simple wood trellis roof with clear plastic covers the dwellings and community porch like an umbrella. Rainwater is collected from the roof and stored in an underground cistern where it’s used to flush toilets and water the garden. The umbrella roof reduces heat gain from the sun and keeps the rain and snow off the dwelling units. This increases the energy efficiency of the dwellings and extends their lifespan. The trellis and units may be added to or subtracted from as necessary to accommodate the residents.